Lugo is one of the four provinces that make up the autonomous community of Galicia in the northwest corner of Spain. Best explored by a RV rental, campervan hire or Lugo motorhome rental in Spain. Galicia is bordered by Portugal to the south, Asturias to the east, and the Atlantic Ocean to the north and west. Made famous by the UNESCO inscription of its Roman walls, Lugo offers an intriguing look back in time as far back as its founding by the Celts. It is perhaps a little known fact that some of the country’s best beaches are located in the province of Galicia in North West Spain. 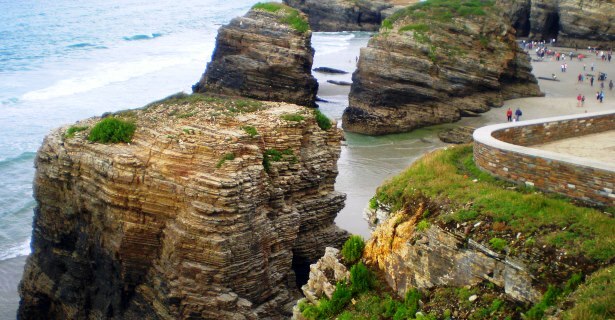 The best way to explore this coastline is by Lugo campervan hire as Lugo is ideally suited for easy travel to Ribadeo, a coastal town an hour north that is nestled between the Cantabrian Sea and the Ribadeo estuary, an excellent launching point to start your coastal exploration. From Ribadeo, your Lugo motorhome rental will allow you the freedom to explore this lesser known Spanish coastline stretching for a little more than 1,000 miles. Travelling west you will be able to look out for some historic lighthouses guarding the coast, and stop a while to surf in Foz, a popular area battered by the Cantabrian Sea but safe for beginners. Moving on you will pass the lighthouse Illa Pancha before you reach the natural marvel Playa de Las Catedrales (The Beach of Cathedrals). This beach is festooned with cathedral-like carvings made in the rocky cliffs by the sea and whose grace can only be truly witnessed from the beach at low tide. Park your campervan rental by the beach, take the mandatory photos, and leave well ahead of high tide. Galician cuisine is mostly made of fish and shellfish, and has a combined 30 D.O. (designation of origin) products including wines using grapes grown locally and nowhere else. Your campervan hire in Lugo let’s you sample this wide variety of culinary offerings as you take in the sights along the way. Travelling still further west before you reach Europe’s most westerly coast, you will come upon one of Spain’s best kept secrets, Viveiro Bay, a tear shaped bay which has beautiful beaches and is surrounded in hills covered in eucalyptus and pine trees. Continuing west in your Lugo motorhome rental will provide you with opportunities to see other lighthouses including the Tower of Hercules in La Coruna which dates back to the 2nd century AD and is the oldest functioning lighthouse in the world. Alternatively, you could travel south in your motorhome rental, campervan hire or RV rentals to Orense or southeast past the monasteries and castles to Ponferrada, an important staging post on Europe’s longest pilgrimage trail, El Camino de Santiago, an ancient route looked over by an impressive castle built by the Knights Templar. If you have the time, you can follow the Way of St. James in your RV rental in Lugo until you reach the saint’s tomb in the Cathedral of Santiago de Compostela, an impressive structure built in the early Middle Ages featuring its original Romanesque elements and later additions of Gothic and Baroque.